Creating music is all about inspiration, and that’s exactly what our instruments are meant to provide. Every Born guitar is built from start to finish in our shop in Broomfield, CO by expert craftsmen and is constructed from the finest sustainably sourced materials available. 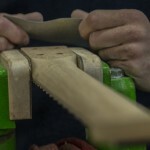 Each Born guitar is built from the finest raw lumber we can possibly source. The tonewood we purchase for our guitars is the top 1% of all wood of a given species in the world. Long before your guitar is built the tonewood (in the form of raw lumber) is carefully selected for its tonal and aesthetic qualities. Once the fine tonewood arrive at our shop, it is evaluated for structural and resonant integrity to ensure that it is suitable for an instrument of this quality. For all pieces that pass our strict standards, the wood is then cured in our shop in order to ensure excellent stability and tonal quality. Once you are ready to design your new Born Custom Guitar our trained staff will be able to guide through the wood selection process, control layout, and other design components to ensure that every little detail represents you and the tone you want your of your instrument. In other words, we make sure you will be getting a instrument that represents you and your vision of a better electric guitar. Our website and online guitar builder are also an excellent tools that will help you understand why a Born Guitar is the best choice for the discerning musician as well as guide you through the multitude of custom options we offer, most importantly, help you through the creative process of designing your new custom instrument. Handwound pickups just for you – Our Pickup Guru, Mike Snider, winds your pickups just for you to compliment the exact woods and design of your guitar. Each step of our building process is integrated with our quality control measures so that every detail of your guitar is just the way you expect it – perfect. After you have finalize your design, and our experts have reviewed your order to ensure that all your options are compatible and will meet your tonal goals we start to build your dream guitar. We use Computer Aided Design (CAD) and Computer Numeric Controlled (CNC) Machine technology to ensure the geometry and technical details are to within 0.001” (0.0254mm) of our design specifications. Once the raw tonewood lumber is machined to the specific specifications of your dream guitar, then our skilled luthiers do the rest by hand to ensure that every little detail of your guitar just right. This is essential when working with wood since it is an organic material that is different from piece to piece unlike metal for example. This is why metal components are easily mass produced. After our skilled luthiers complete the shaping, sanding and finishing process for your guitar body and neck, your guitar goes into assembly. This is where all the passion, love and hard work that we put into each guitar comes together to form your dream guitar. Every guitar is assembled and wired up with the utmost care and attention to detail. Then before we decide that the guitar is completed it goes through a rigorous testing and QC process. Finally, when we believe the guitar is completed and up to our quality standards our Head Luthier evaluates it one more time to make sure everything works properly and the tone is just right. Finally once your brand new instrument has passed our strict quality and performance standards we put it in a brand new case and ship it off to you. When you receive your guitar we expect that you will be delighted to see your vision come to life in true form. We recommend that you spend lots of time with your new instrument so that you can get to know all the little nuances of its tone and behavior. It is our expectation that you will fall in love with your instrument and cherish it for many years to come. In fact, we build our instruments to last forever so that one day you can pass it down to your loved ones.